LIVONIA, Mich. (March 27, 2006) – If you have a ROUSHcharger, turbocharger or other supercharger system on your Ford Mustang or F-150, it’s pretty evident that you are a performance driver. So, naturally you will want to get the most out of your vehicle, which makes the ROUSH Performance Colder Spark Plugs a must for supercharged, turbocharged and nitrous applications. These Colder Spark Plugs are designed for the Ford Modular three-valve engines (4.6L and 5.4L), including those found in the 2005-2006 Ford Mustang GT and the 2004-2006 Ford F-150 with the 5.4L, 3V engine. This is the same spark plug that is installed in the Stage 3 ROUSHcharged Mustang and F-150 packages. The need for installing a colder spark plug is to prevent pre-ignition and detonation of the fuel due to the higher cylinder temperatures found in the supercharged engines. 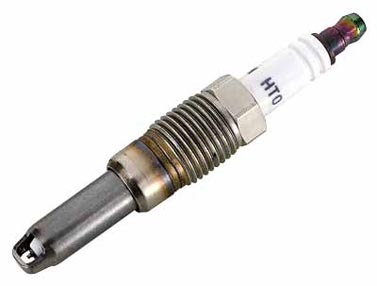 Pre-ignition is typically caused by many factors, such as an overheated spark plug tip which acts like a glow plug to ignite the charge. This puts a tremendous load on the engine and adds considerable heat, a recipe for serious damage. These ROUSH Performance Colder Plugs are one heat range colder than the stock Mustang plug and are designed specifically to handle the high boost pressure and air flow into the engine. The gap on these plugs is 0.045 inches. Ideal for custom tuning applications, the ROUSH Performance Colder Spark Plug (part number 401546) has a suggested retail price of $17.99 each. Based in Livonia, Mich., "The Art of Performance Engineering" takes place at Roush Performance. In addition to the Stage 1, Stage 2 and Stage 3 Ford Mustang and F-150 styling, handling and performance upgrades, a complete line of performance parts and engines are offered. For more information on the ROUSH Performance Colder Spark Plugs, or any of the other products, visit www.RoushPerformance.com or telephone toll-free (800) 59-ROUSH.